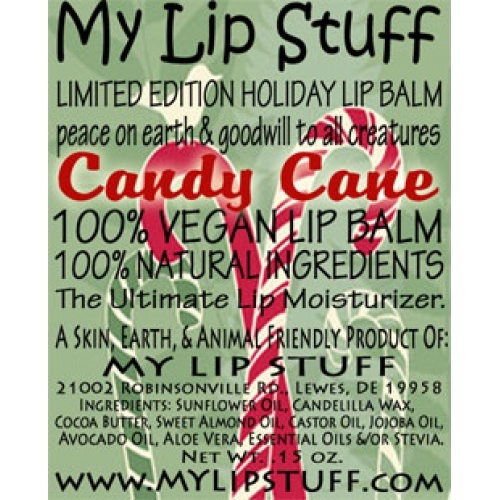 MY LIP STUFF IS A HOMEMADE, NATURAL LIP BALM MADE FROM ONLY THE FINEST BUTTERS, OILS, & WAX. We modified our recipe to replace the beeswax with CANDELILLA WAX. These balms are the same moisturizing formula as our regular My Lip Stuff lip balms. we came up with a few 100% natural (using only essential oils and/or stevia (a natural sweetener)) flavors to choose from. STANDARD .15 OZ LIP BALM TUBE ONLY. Ingredients: candelilla wax, sunflower oil, sweet almond oil, castor oil, cocoa butter, jojoba oil, avocado oil, aloe vera, essential &/or flavor oil.